What is collective intelligence? It sounds like something pretty sophisticated, doesn’t it? Henry Jenkins believes that, everyone knows something, but no one knows everything. Jenkins defines collective intelligence as, “…the ability to pool knowledge and compare notes with others towards a common goal” (Jenkins, part 2). Modern society is full of collective intelligence. With so many communication tools at our disposal, collective intelligence is fairly easy to come by, take Wikipedia for example. A website where users can contribute their information and publish it to a central location seems very convenient, but the fact that almost anyone can edit these article does raise some red flags. Growing up, my father had always stressed that I should listen to “real” music – not some compilation of sounds jumbled up from a computer to make music. He got me listening to artists and bands like the Red Hot Chili Peppers, Dave Matthews Band, Carlos Santana, and Peter Gabriel. Of all the bands he showed me, my favorite was certainly Pink Floyd. Given that my father grew up listening to Pink Floyd, I had no reason to doubt him and what he had told me about them. The Wikipedia page matches the same information that he had told me. Everything from their rise to fame in the 1960’s to the breaking up of the band and beyond is correct and I would think that because of the number of edits the page has had since it began in 2001. With almost 16,000 edits and with over 9,000 edits coming from the top 10 percent of active users, it’s safe to say that Wikipedia’s collective intelligence on Pink Floyd is accurate. 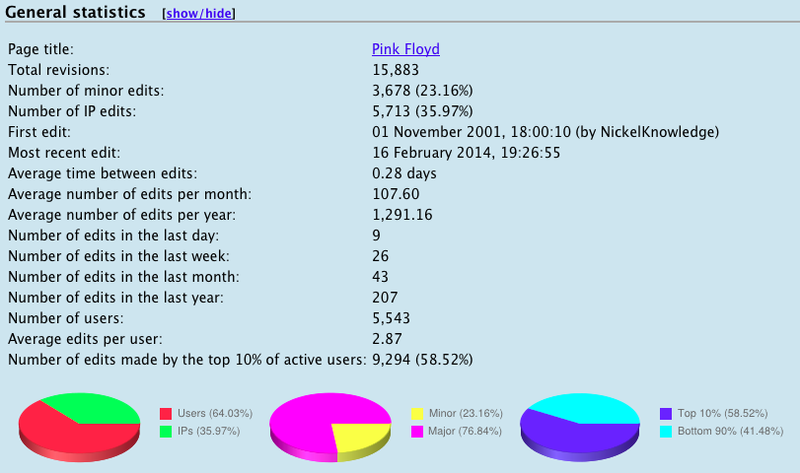 The Pink Floyd Wikipedia page is also one of the most frequently visited pages of all of Wikipedia. 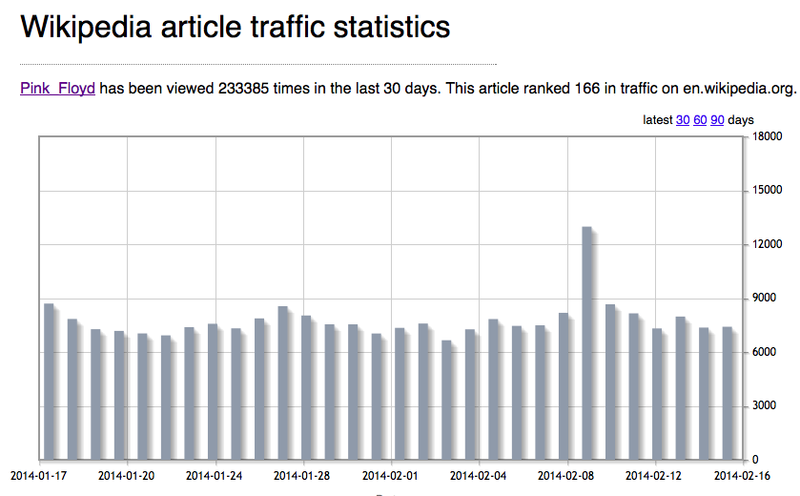 Within the last 30 days, the article has been visited 233,385 times! The amount of web traffic alone should say something about the accuracy of the article. With that many people visiting the page, the information needs to be as precise as possible. From generating so much web traffic, Wikipedia does not grant permission for just anyone to edit. There are certain criteria that a user must meet before being able to edit this article, which can also attest to the validity of the information given to us in the article. In this case, collective intelligence is a beautiful thing and has become an everyday occurrence. “Pink Floyd.” Wikipedia. Wikimedia Foundation, 16 Feb. 2014. Web. 16 Feb. 2014. Jenkins, Henry. “WHAT WIKIPEDIA CAN TEACH US ABOUT THE NEW MEDIA LITERACIES (PART TWO).” Web log post. Confessions of an AcaFan. N.p., 27 June 2007. Web. 12 Feb. 2014.